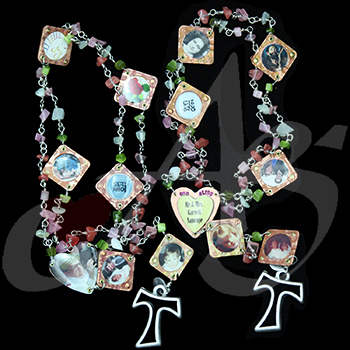 Enjoy this beadscape of a sunset through a full conventional rosary. 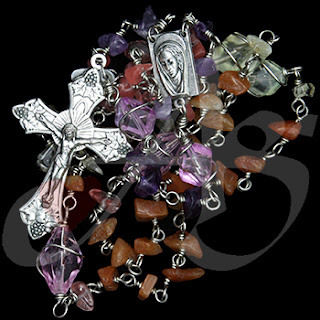 This full rosary is full of sunrise or sunset colors. I just love God's color combination - sometimes colors you wouldn't think to put together. I loved combining the various orange hues especially pyrite which has a sparkly inset - it is actually sand glass! God is so awesome with His amazing creations! Enjoy this conventional full rosary depicts the ocean waves... love the colors! As I was waiting for the sun to rise I was fixated on the waves... the mixture of color and swirl. Sometime greens, blues and even pearly white. I took that color combination and wrapped it up into a rosary... again bringing the person back to a 'happy' place. I know for many listening to the crash and lapping of the water is quite soothing... I have grown to appreciate it's amazing-ness. The stones used to capture that moment are faux pearls, green fiberglass, serpentine, amazonite (one of my all time favs) and moss agate. When opened up it looks beautiful. I have fun with my bead-scapes asking people what they see or feel... this one was a winner hands down... W A T E R !!! Yeah! Taking my inspiration to a full conventional rosary - boutique of flowers. Here my bead-scape isn't really a landscape inspired but it is an image inspired - a boutique of flowers. Our prayers are a boutique of petitions and offerings. The picture doesn't depict well the flowery image with the green stems and various colored blooms but its all in there (too difficult to shoot such a large piece clearly). 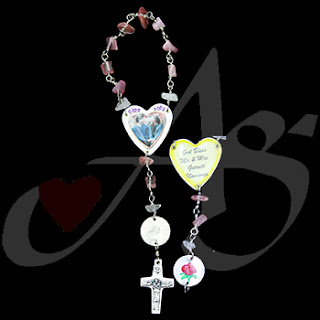 The Our Father beads are wire wrapped like a stem of flowers would be for a wedding or given as a gift. 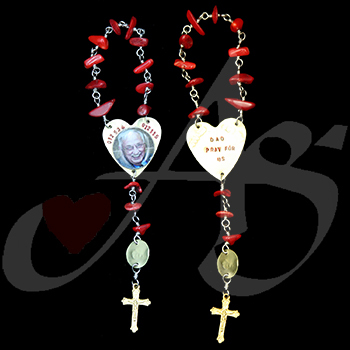 This new inspiration added a touch of challenge to making rosaries - and for me that is fun! 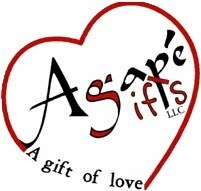 www.AgapeGifts has more inspiration to view! Enjoy this full decade rosary bracelet, another bead-scape of the Missouri valley in early morning! To be truthful this was my first inspiration to capture a landscape - this was the early morning in a valley with morning mist rising. It was quite breathe taking. I wired together my inspiration but it sat for awhile trying to figure out how to work it together... with God you have to be patient... it came a few years later. The green part is the trees catching a glimpse of the rocks then the mist in the sky. The crucifix is the bottom part looking at the piece upwards. I was very excited with my idea but even more thrilled that I could use it as a rosary bracelet. Great way to hold fond memories of your happy place while you are praying... takes you right back there... amazing! Enjoy this full rosary bracelet depicting the Sunrise - a bead-scape! This bracelet was an inspiration while on vacation viewing the sunrise upon the ocean - magnificent sight to be hold! (Even if you have to get up extra early!) The copper embossed metal gives some warmth to the artist piece - everything is hand created with exception to the crucifix. The multiple shell beads bring the rising color to the 'bead-scape'. The tricky part was making sure the length of the decades were evenly matched to size to ensure that the bracelet would lay even and flat. I was very please with the outcome of this piece and it inspired me to think this idea through other pieces... making rosaries 'paint' a picture. 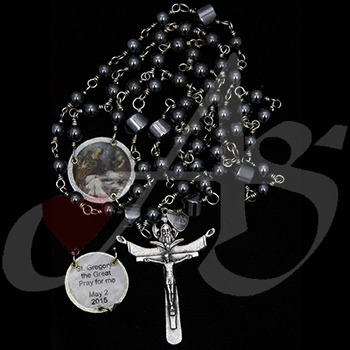 Enjoy this manly confirmation rosary w Saint image and dates. 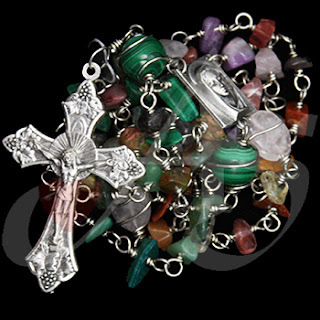 This rosary is made with hematite giving it some weight - great weapon of prayer! The Saint on the center medallion asks for his confirmation Saint's intercession with the day of the sacrament as a reminder of when the descent of the Holy Spirit during the sacrament of confirmation. You can also see the Trinity Crucifix, perfect for confirmation! St. Gregory pray for us! 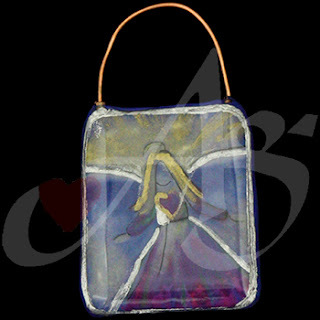 Enjoy this purse charm w original painting by Laura - AIA! This angel has a series of variations since I was trying to paint an angel for someone who had a thought in her mind... my job? To get it to print! LOL But I was happy with the outcome. I enjoy now taking my pieces of artwork and then embellishing them further either on polymer, like this one, wood and or metal. I like to extend the painterly feel. This piece is then coated with a resin to give it a glassy finish! I feel this little angel exudes happiness! 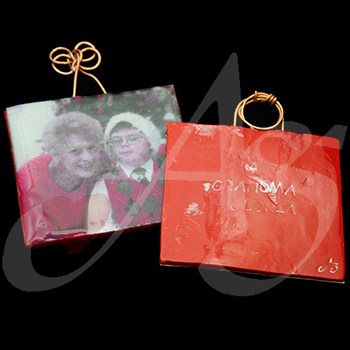 Enjoy this family ornament remembering a Grandmother who has gone before us. This is a wonderful way to continued celebrated memories of family members who are not here with us physically but spiritually! This piece was made with polymer clay and copper wire work. There were two ornaments made hence the reason for different wire work. May you rest in peace! 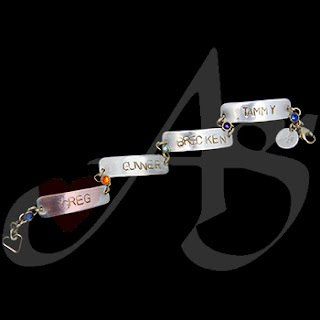 Enjoy this family bracelet - names stamp w special months honored! This sterling silver filled metal and sterling silver wire work is accompanied with Swarovski crystal gold-filled buttons - linking the family together. Settle stamping of each of the family members names on both sides in case the textured plank flips over. Elegantly simple yet filled with much love and prayers. 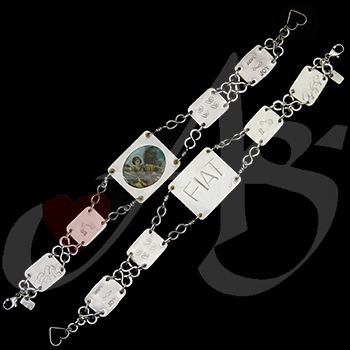 Enjoy this sterling silver filled family bracelet - each panel holding a special message. This piece took some time in the making. Lots of brain storming to figure out the best images, words to represent the family - including the wearer, the mom, wife... It is always a pleasure to design such a cherished piece. St. Michael pray for us! 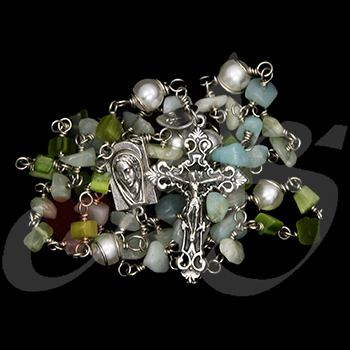 Enjoy this resurrection finger rosary - keeping your loved one in your pocket! This amethyst stone finger rosary was made for a dear devoted Catholic friend which depicts a image of a beloved sister who was lost to cancer. I met my friend in art school so I wanted the finish to have an artsy look tying our friendship together. Donna may you rest in peace - much love to you K!! Remember to pray for the those who have gone before us - great way is through a finger rosary! Enjoy! This finger rosary remembers the passing of a beloved father - the red for the month he passed away. Encouraging words to pray for his time in purgatory then release into heaven. Great way to pass down a memory for generations to come! Enjoy a wedding finger rosary - capturing marital sacramental graces throughout the day with his and hers finger rosary keeping it in their pocket for daily reminder and guidance especially when in need of a prayer! Pray for each other! 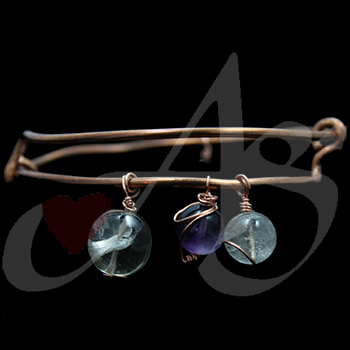 Enjoy this copper adjustable bracelet reminding the wearer of the Father, Son and Holy Spirit! The colors of the stones help with the three different persons in ONE - all together always wanting for you and being there for you!! I also like things in groups of three... just a gentle reminder... God is always there... maybe not how we think or expect - but if you open yourself to the Holy Spirit you will appreciate those little graces and miracles... Enjoy! Power packed weapon against the devil! Enjoy another wedding rosary - this one is packed w meaning at every turn. Praying it will give the couple many graces. This rosary is a powerful weapon against the destruction of the sanctity of marriage. 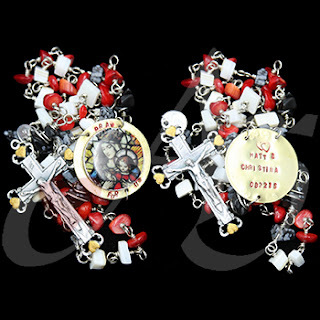 This rosary holds fourteen different images each specially picked for the bride and groom, helping them depend on the graces from God to help them through this journey of life. The images reflect themselves as toddlers to adults with the support of their parents - depicting each wedding day. It also beckons the call of their favored Saint to help guide them to be the path of holiness for each other as well as quoting their favorite Bible verse. Praying with this rosary together as a couple will definitely give them strength and courage to take on any adversity that may be thrown their way... which we all know is part of the journey. St. Theresea and St. Francis pray for them as well as for us! Enjoy!! 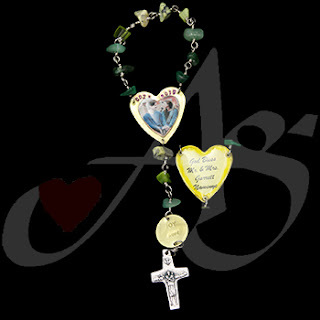 Enjoy this special wedding rosary - evoking a Saint's blessing w personalized names & dates. The stones represent the wedding color celebration. Every thing hand selected as well as hand crafted. The commemorative wedding rosary is an incredible gift to give that will last for generations to come! I thought I had got all my posting for the month of January transferred over to this blog but for some odd reason that did not happen... this social media eludes me. Just give me a saw, drill, metal and drawing device or stones and I am much happier! 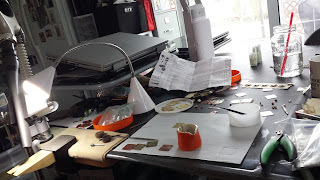 I will try to solve that problem today - if you want to get a glimpse of the work I have been doing please check out my facebook page - Agape Gifts selfless jewelry; or follow me on instagram to get daily shot of my work... Fb shows a piece of the day and if I remember the shot of my work. ok - back to electronic unraveling... probably a good thing to do today since my hands hurt from the jewelry labor this weekend! :) Working on a competition piece. Please say some prayers!! Thanks! !